St Rose (1586 – 1617) was born Isabel Flores in Lima, Peru; her country was then a Spanish colony. She chose the name Rose at her Confirmation. St Rose emulated the life of St Catherine of Siena. She fasted three times a week, abstained from meat, performed many physical penances in secret and spent numerous hours in devotion to the Blessed Sacrament. 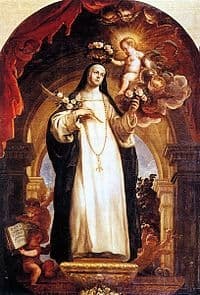 St Rose rejected all marriage suitors, despite her parent’s best efforts, and planned to become a nun but her father disallowed it so she joined the Third Order of Dominicans while still living in her family home. She also took a vow of chastity, wore a habit and used the money she earned from the sale of flowers and fine embroidery, to care for the local poor. When St Rose died at the early age of 31, she was so well known for her piety and support of the poor that her Requiem was held in Lima Cathedral. A shrine for her was established in the Lima Convent of St Dominic beside that of St Martin de Porres and St John Macias. St Rose was the first person from the Americas to be canonised a Saint. Her Feast day is the 23rd August. She is the Patroness of Peru, parts of the Philippines, the indigenous people of Latin America and those who are oppressed for their religion. Let the fragrance of thy virtues diffuse itself in our lives. obtain for us courage in the practice of penance. Teach us, O St. Rose, to love Christ Crucified and Mary His Mother. CategoriesSaints Library TagsRose of Lima, Saint, Who was Rose of Lima? “Eternal Father, I offer You the Most Precious Blood of Thy Divine Son, Jesus, in union with the Masses said throughout the world today, for all the Holy Souls in purgatory, for sinners everywhere, for sinners in the universal Church, those in my own home and within my family. Amen”. My Crucified Jesus, wash me with your most Precious Blood. Look upon me as the good thief, who hung on the cross next to You at Calvary. Dear Lord, look upon me like the Good Thief. And I should be so lucky, full of Peace. Amen.